Discussion in 'T&AA - Travel and Anything Automotive' started by dbg, Jun 12, 2012. Its a farewell trip planned for a schoolmate going off to Univ of N.C. Duration: 2 days + 2 nights, starting on 29/Jun afternoon & returning on 1/Jul evening. Transport: Booking Cabs from Pune. --Any/all tips will be appreciated on ..
Current temperature is from 32-28 degrees. John and ManISinJpr like this. You're in Pimpri / Cinchwad? See that you'll be going thru.. so why not take a stopover at.. Lonavala? No .. I'm in Hyd ..
All of us will rendezvous in Pune on Friday morning and then start from there. 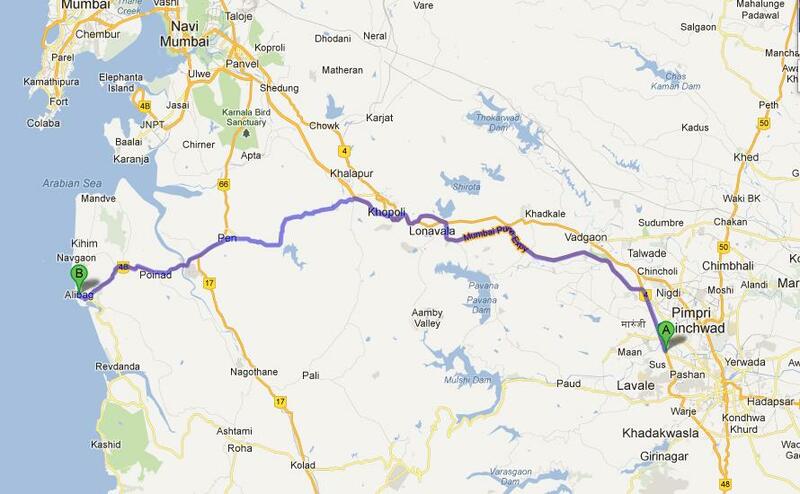 The route does lead through Lonavala .. would love to check it out. Nice trip !! but why the heck do you need cabs?? for such a short ride !!! Umm .. yea.. none of us have any bikes ..
No question of drinking & driving. The weather is gonna be humid for sure, however do pack a rain jacket to actually have fun in the rain! And lonavala will be great this time of the year! If being mobile is essential, then take a cab, else there are some nice volvos which will do the route as well. Can we get cabs/bikes there at Alibag, its a a touristy place so will that be better ? Alibag from what I know is a great place for modding bullets etc. So you should be able to get bikes on hire even. And it would be a great experience! Dil Chahta hai style! dbg and kauffmann like this. So Alibag is final then. Been there once, wouldn't mind going again though. I think thats the plan .. whatever happens i've ready taken a holiday .. so I'm coming over ..
Best of luck for your trip guys !! If you're planning to halt at lonavala, I would suggest going to Lion's hill/ Tiger point and enjoying the breeze, landscape some corn pakodas and if you would fancy some hookah. They have good enough shelters there to protect you from the rain as well. I see that you're 5 guys, consider getting a villa/bunglow there on rent, would cost ~4k a night. Speakers can also be carried for in-house entertainment. For water sports - BARGAIN as much as possible. Have an awesome time, cheers! Quick question on the weather ..Whats the weather like now a days.. any chances of rain ? if it rains is it still advisable to go .. Do the beaches/Water_Sports close up in case of rainfall ? What if it rain, like a hell lot, then any backup plan/destination. Its been raining on and off in Pune, I really have no clue about Alibagh at this time of the year. I hope the link will answer all your questions. I think we'll settle for Mahabaleshwar.. Alibag doesnt seem to be happening .. not enough people. Okay .. time for the Post-Trip update..
Well, many of our friends couldnt turn up to Pune for the trip so that plan was cancelled. Instead had a laid-back extended weekend in Pune .. Weather was great with just some bit of rain in between. Amazing Spiderman 2D & 3D .. lots of food n booze, Pune is great for this as I discovered. Thanks to pELLuRD & RC for being the wonderful hosts. 1. Stay informed about impending Dry-Days (which tend to ruin a weekend) .. Stock-up in advance. 2. Don't mess with Auto-Rickshaw drivers in Pune. 3. Always have a carefully crafted exit plan when going to shady pubs..
4. Whiskey makes everything better .. Thanks dbg for making last weekend memorable.